Today, after the student lecture I sat down with Theo Muller who is one of the most brilliant minds in traffic signal control in the Netherlands. 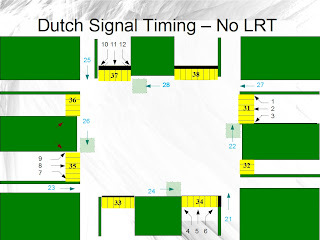 He provided training on VRIGen which is a program used to develop signal timing phasing plans given the complexity of the movements for the multimodal system that is common with buses, trams, bikes, and pedestrians at so many intersections. Incorporation of bikes, trams are something the Dutch have done because of the challenges or complexities these modes have presented as a part of large projects. 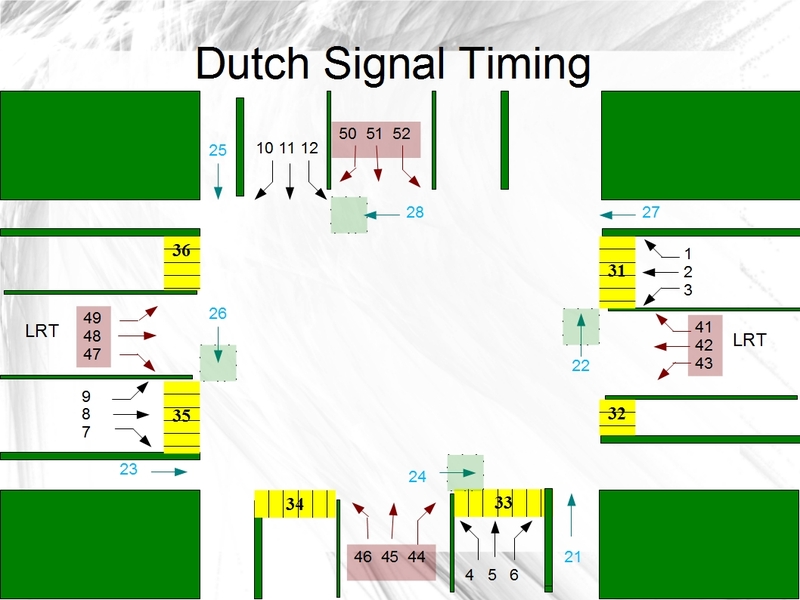 The signal phasing numbering scheme is set up in VRIGen and it is used throughout the country to standardize and allow them to deal with all (most) possible options. It seems they have used every number from 1 to 100 to make the various modes work together under a standard umbrella. be handled different than shown. How is this different than the U.S.? In the U.S., we have 8 vehicle phases, multiple overlaps, and pedestrian movements tied to the parallel vehicle and LRT is handled as a preempt as opposed to another movement. 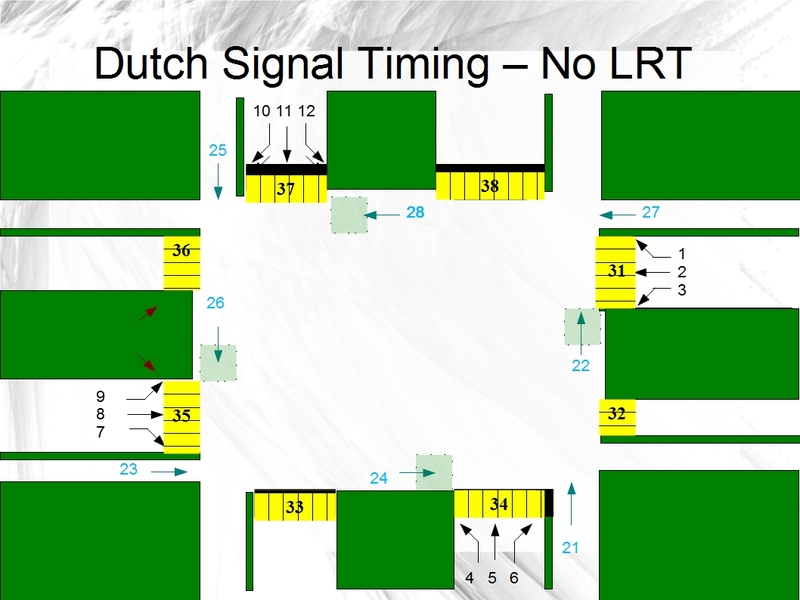 The standard signal controller is not prepared for light rail or bus crossings in both directions (east-west & north-south) running on the median. 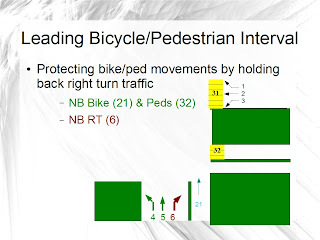 The Dutch also assume the special considerations of the use of multiple numbers to allow 2 stage crossings as a part of the bikes & peds because of their slower speeds. This also allows "following" phases to occur for vehicles so progression can be achieved through an interchange or a set of two signals, like you might have at a diamond interchange. What common guidelines do they apply that the U.S. should adopt? Another common approach is to use snappy detector timing. The use of 1.5 seconds of extension from the upstream (advance) detector is limited to the detector placed 30 meters from the stop bar with a detector that is 12m long. They use a 2.5 gap on the stop bar detector with a 2.5 second extensin with presence mode enabled, meaning that when a vehicle is present on the detector it continues to ask for more green. We discussed the use of leading pedestrian (or bike) intervals (LBI or LPI) and it was surprising to hear they use 2 secs. 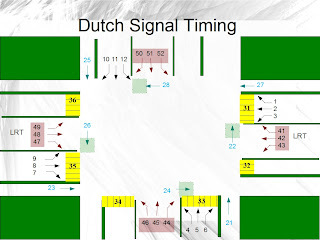 They use LBIs when there is no right turn lane exclusive for controlling the traffic separately in two separate "streams" which is much preferred in the Netherlands for safe operations that remain efficient. Notice I stated safety was first, Theo indicated that more than half of all signals are there for insuring safe conditions for all users. Our MUTCD is a far cry from that without the proper use of engineering judgement and a strong protection of future multimodal traffic growth. The bike movement is labelled 21 (on the left in the red brick area) and the right turn is labelled 6 in the graphic (to the left of the car you can see the right turn arrow). This sort of configuration represents a reduction in vehicular capacity if there is a heavy right turning traffic and the photo shows a shared left turning and through movement which results in some complications potentially. There is clearly an emphasis of bicycle movements at the intersections and in the photo you can see the pedestrian is not striped through the cycletrack. It is assumed that it is no problem for the people on bicycles to sort themselves out with pedestrians and it is clear to pedestrians that they aren't supposed to be in the cycletrack.